Comeback 7″ Single nach einigen Jahren und als Limited vinyl edition auch als Beipack im Musikexpress. Ob die Strokes nach dieser Pause noch relevant sind? Waren die Herren jemals relevant? Die Platten sind gut, aber dass die so durch die Decke gegangen sind habe ich nie verstanden. Die A-Seite hat das Lied Under Cover Of Darkness und dieses ist ganz einfach ein Strokes‘ Song. Gitarre, etwas Dreck, gute Struktur und Melodie und dann auch die typische Julian Casablanca’s Stimme: korrekt. Auf der B-Seite dann You’re So Right, das klingt anders! Jetzt wird’s spannend. Irgendwie Elektrosound mit dunklem New Wave Einschlag (was auch immer das sein mag, hehehe) und dann isses auch schon wieder vorbei. The Strokes are back and a new limited edition 7″ vinyl single comes alone with the music magazin musikexpress. That is a nice goodie – vinyl rules! 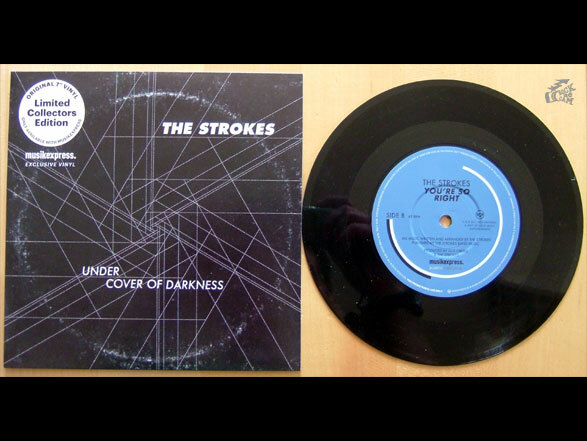 Side A has the song Under Cover Of Darkness and it is a typical Strokes‘ song. Guitar, bit of garage, good structure and the voice of Julian Casablanca’s – yes a typical The Strokes‘ song. On the B-side however is You’re So Right and this really pricked up my ears, cause this is different. OK on a single B-side you can experience but still not everybody does it (and I think the song is even on the Angles LP). You’re So Right sound like electro, kind of dark New Wave (and now try to figure out what dark New Wave is, hehehe).